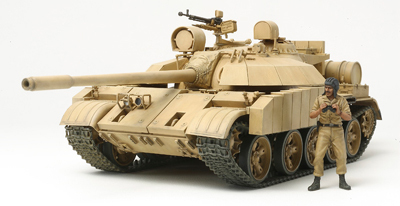 1/35 Iraqi T-55 "Enigma" Tank Discounts Apply ! TAM35324 - 1/35 Iraqi T-55 "Enigma" Tank. Iraq was a major operator of T-54/55 series tanks and ordered their first 250 T-54s from the former Soviet Union in 1958, followed by 50 more in 1965. Many of these were lost during the Yom Kippur War so 300 T-55s were ordered in 1973. Other purchases followed: 50 and 400 T-55s from the surplus stocks of East Germany and Poland respectively in 1980; 250 T-55s and 150 TR-580s (Romanian version of the T-55) from Egypt and Romania respectively in 1981; another 400 T-55s, including some Czech-built examples, from the former Soviet Union in 1981; and about 1,500 Type 59 and Type 69 tanks were bought from China during the 1980s.